Somewhere in the seed of the '50's, the fissures from which the '60's sprouted were beginning to appear. Not everyone saw them. In fact, very few people saw them. 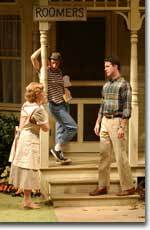 But playwright William Inge was one of those who did. He had a special affinity for this time. Later, when his time passed, much to his own irrepressible frustration and sorrow, he felt marginalized and took his own life. But Inge had the '50's number, and he expressed this in two classic works, the screenplay, Splendor in the Grass, for which he won an Oscar, and the drama, Picnic, for which he was awarded the Pulitzer Prize. The Denver Center Theatre Company's current production of Picnic lays bare the genius of this work, and thus answers the question that nagged many in the theatre community when it was included in this 25th anniversary season. In the hands of director Nagle Jackson, Picnic is not a maudlin tale of smoldering desire, but a rich tapestry that interweaves the contradictions of this decade into a cohesive tragicomedy. On Labor Day, 1952, we find ourselves in a small Kansas town, in a nation beginning to feel the first effects of post-war prosperity, led by a war hero and President who was born not far from this spot. The coming school year and autumn loom in the sultry air, as the locals look forward to the annual picnic that provides the last festive occasion before the practicality of survival sets in. Reminiscence rises from Vicki Smith's set like an insatiable hunger. At Helen Potts boarding house, the appearance of a lean, hungry, handsome stranger stirs up the dust. Homely Helen is pleased as punch to have him around to take care of some chores and gobble down her pies, just so she can gaze at him and sigh. Kathy Brady plays Helen like an old fiddle, coaxing girlish trills and contrapuntal punch lines that bring down the house. The object of her impossible longings is Hal Carter, a pleasant but simple hunk, who, as it turns out, is originally from these parts. Elijah Alexander's tall, dark, muscular frame and mostly shirtless appearances make Hal a catalyst for others' self-examination. But by portraying him as a slightly goofy and socially awkward gentle giant, rather than an enigmatic "Montgomery Clift" type as he's described in the text, Alexander and director Jackson create a fertile space to nurture the comedic tension between the hot and bothered distaff population and a naïve man-child. Millie Murphy, the youngest daughter of the rooming house proprietress that lives across the way from Helen, takes to Hal immediately, drawn to his natural athleticism and kind nature. At an age when her womanly instincts are just beginning to stir, Millie is ready jettison her intellectual prowess and ignore Hal's limited smarts for some of his manly attentions. Shannon Koob handles Millie's coming-of-age passage with aplomb, cushioning the girl's mercurial swings from earnest tomboy to yearning young woman with a carefully applied petulant streak. Millie is no competition, though, for her beautiful, older sister Madge, who turns the heads of every male from the post-pubescent to pre-senile. Yet Madge is at her own crossroads, feeling confined by her mother Flo's limited ambitions for her — a marriage to the genial, yet square Alan, and his family's wealth — and her own limited employment opportunities based on her average intelligence and the gender prejudices of the '50's marketplace. Though her horizons may have been limited by her past circumstances, Madge is ripe for adventure. In both a physically stunning and psychologically delicate portrayal, Melissa Murphy turns what could be an self-absorbed character into an evolving, complex protagonist who draws our sympathies. Murphy's Madge is aware of her striking beauty, but remains unselfconscious in front of gawking men; she knows she is ungentrified and of meager means, but she longs for the unexplored world. It is her decision and catharsis that is center stage. For Flo Owens, Madge is the path to redemption. In her older daughter she sees herself before she married and her prospects went south; she hopes to prevent Madge from making the same mistake by having her marry Alan. Robin Moseley's Flo, her youth past but her good looks intact, subordinates her own desires to methodical practicality as she struggles to raise her two daughters and keep appearances. Flo's roomer, Rosemary, is a middle-aged school teacher caught between her fading dreams and her last chance for marriage. Her loneliness verges on the tragic. Annette Helde gives us a Rosemary whose physical reaction to Hal is palpable, yet is totally aware of her folly, and bitter for it. She, too, can redeem herself, but only by refusing to succumb to despair and taking action. The current object of her matrimonial plans is Howard, a slick insurance salesman and good old boy from down the road a piece. Randy Moore delights as this shameless opportunist and proletarian sensualist. Even as Howard's fate is sealed in, what for him must be said, a most unanticipated and undesired manner, Moore finds a treasure trove of humor. The rest of the ensemble retains the polished consistency of director Nagle Jackson's archetypal casting; Josh Robinson remains fresh as Alan, Madge's longtime beau, never straying from his class-induced road map for success; Tracy Shaffer and Gabriella Cavallero are lively and laughable as Rosemary's busybody friends; and Justin Yorio teases Millie and Madge with gusto. Director Jackson's detailed production leaves no doubt that Inge's drama is an American classic. When the train whistle rumbles through this small town awakening remembrances and stirring possibilities, it peals for us. 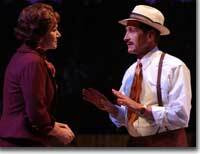 The Denver Center Theatre Company's Picnic runs through November 15th. 303-893-4100.